The Bruins battled down low with the Democrats big men despite being vastly overmatched in height. Friday's semifinal game between Barlow and Jefferson was a matchup of two opposing styles. The high flying Barlow squad loves to play the game on the perimeter while Jefferson, on the other hand, wins the majority of their contests by using their size to grind in the post. 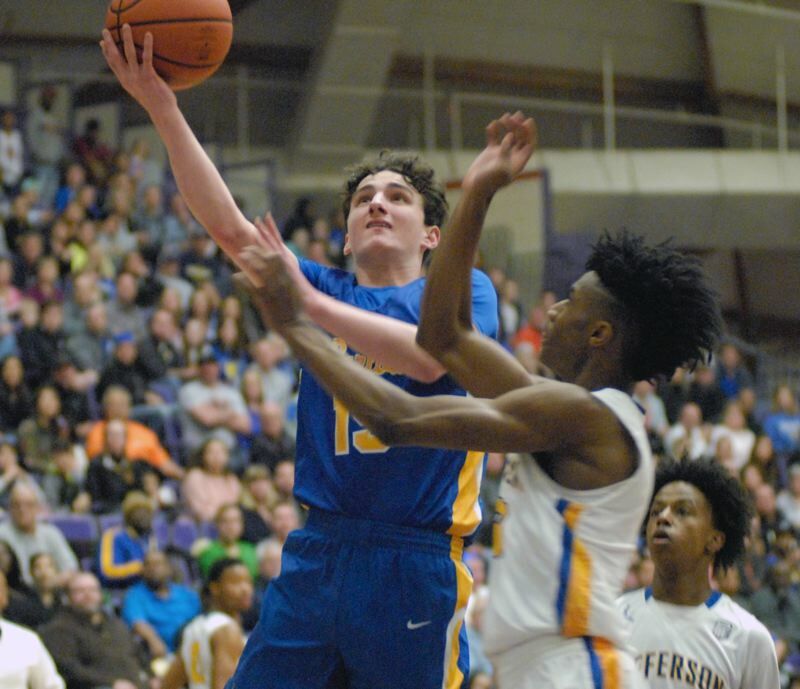 With seven players on their roster listed at 6-foot-5 or above, top-ranked Jefferson had their way with the undersized Bruins on Friday night and advanced to the 6A state title with the 80-60 victory. Barlow played in a matchup zone for the entire game with the hopes of stopping the Democrats big guys down low. But Jefferson guard Jalen Brown hit four open 3-pointers in the first half, which forced the Bruins to guard the perimeter more than they had initally hoped. "In our first half I thought we ran our zone very well, but when Brown started hitting his first couple threes, he really spread us out a bit," Barlow head coach Tom Johnson said. 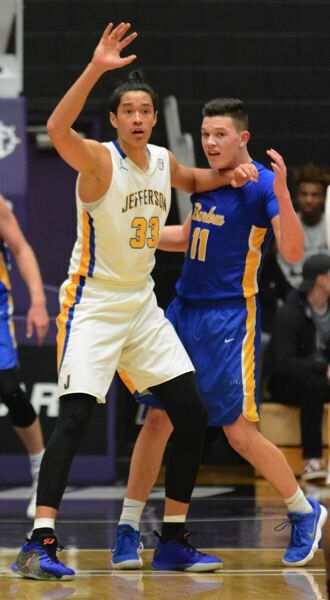 Barlow's main focus coming into this game was slowing down Jefferson's 6 foot, 10 inch center Kamaka Hepa, who is committed to play basketball at the Univerity of Texas next year. The Bruins were able to make things difficult on him in the first quarter as Hepa scored just three points in the period on 1-of-5 (.200) shooting. Dominic Jacoby, Austin Forrar, Evan Inglesby and Jaren Hunter all took their turns battling the star post in the paint. "I just tried to stay energetic and make (Hepa) work and make sure he gets nothing easy," Hunter said. "We were just trying to front him in the post and trying to make him uncomfortable." While the Bruins were have been successful in stopping Hepa in the first quarter, the second period was another story. Hepa had 11 points on 4-for-4 shooting in the second period to help the Democrats take a 40-33 lead a the break. He finished the first half with 14 points and 10 boards. Hepa ended up with a game-high 23 points and 15 rebounds. "I thought we did ok against (Hepa) but when he started to assert himself on the low block, it became really difficult," Johnson said. "With his size and skill, he's tough to stop." Barlow also had a difficult time stopping Jefferson's other big man in Khalil Chapman. The 6-8 post also posted a double-double for the Democrats with 13 points and 10 rebounds. "Our main goal was to keep (Jefferson) off the boards as much as possible," Inglesby said. "They kind of wore us down and made it tough." Jefferson came down with seven offensive rebounds in the second quarter which led to 10 second-chance points for the Democrats. But Barlow remained within striking distance thanks to the aggressive offensive play of Forrar. While Barlow settled for a lot of long jumpers for most of the game, Forrar was the one player that attacked the rim for most of the night. The senior forward had 14 points and led the Bruins with seven rebounds. Barlow actually outscored the Democrats 10-6 on points in the paint in the third quarter. "We wanted to show them that we can be physical and that we weren't going to back down," Forrar said. "We're here for a reason. This team has fought and battled all year long and different players step up for us every single game." By the end of the game, Jefferson had only outscored the Bruins 28-22 on points in the paint and 19-18 in second-chance points. The Democrats also out-rebounded Barlow 45-36. While Barlow ended up being able to limit the damage in the paint, their perimeter shooting greatly suffered. The Bruins were just 8-of-33 (.242) from behind the arc and were outscored 15-4 from the charity stripe.